Gatsby Summer Afternoon 2018. Photo: Richard Aiello. It was a record breaking year for the Art Deco Society of California Gatsby Summer Afternoon. Just over 1000 people gathered on Sunday, September 9th for an opportunity to live for a day the elegance of the 1920s/1930s. Attendance to Gatsby Summer Afternoon has been on the increase for the past several years. I met many first timers. One young woman heard about the event from Face Book and was happy to pull out her extensive collection of all things vintage. Quite a few attendees were from LA and a woman from the Sacramento Art Deco Society was very impressed with her first visit, commenting on how well organized the event was. I like how this couple, Kim and Kenneth, coordinated their colors and gave a nod to the upcoming fall season with touches of orange. Katie and Gregg toast the day. Katie made her dress and it turned out great! This was Ann’s first Gatsby Summer Afternoon. Doesn’t she look lovely? Ann found her dress at Relic Vintage in SF. Jill (pictured right) was attending Gatsby Summer Afternoon for the first time with her old college chum, Amy. Jill told us that she remembers the very first invitation from 34 years ago. She wasn’t able to attend and for one reason or another hasn’t all these years since. But she wanted to and has been planning. Finally this was the year! She was so thrilled to win Best Petite Picnic Site her excitement and big smile made my day. Oh, and she made her dress! And here’s yours truly. This is the third time I’ve worn this dress to Gatsby Summer Afternoon. I found it at Vintage Fashion Expo. The lace gloves came from Lacis in Berkeley. The purse was my grandmother’s and the pendant was my great grandmother’s. People often comment on my sunglasses, which are not period. They’re Liz Claiborne, circa 1990s. It takes a lot of volunteers to put this day together. A round of applause for the committee and Event Co-Chairs Heather Ripley and Marie Riccobene. Gatsby Summer Afternoon was founded by Laurie Gordon. 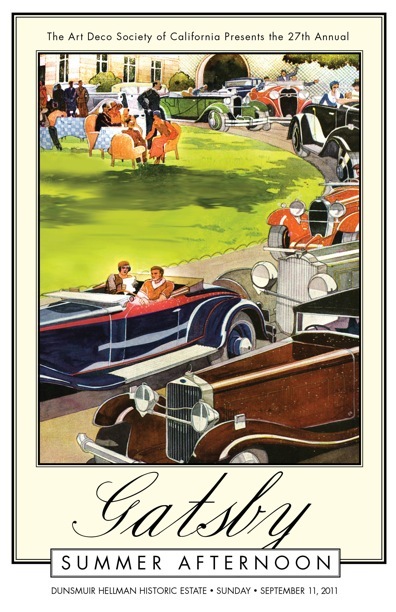 We look forward to next year when the Art Deco Society of California will celebrate 35 years of Gatsby Summer Afternoon. See what all the buzz is about and join us, Sunday, September 8, 2019. Late last month I ventured to Woodland Hills, CA for my very first Costume College, which is an annual “costuming arts conference” brought to us by Costumer’s Guild West, Inc. Attendees enjoy three days of workshops and lectures on all things period costuming and history. There are also special events such as an opening night social, a grand ball with a red carpet! Afternoon tea, a small marketplace, an exhibit, photo ops, and I’m sure I’ve left out something. Each year has a theme and this year it was – Dressing the Royals. Costume College has been around for 26 years and over time it has grown from a mostly local event to attracting people from all over the country and the world. In 2017 there were just over 400 attendees – this year CC topped out at around 650. That’s a big leap in one year. It seems cosplay (big in the LA area) has sparked an interest in period costuming prompting people to check this out. I would also suggest that the current desire for “experiences” might also play a role. I spoke to a few people who were first timers. One woman from LA has been involved in reenactments but she had only recently heard about CC. Another is a regular at various cosplay events and wanted to expand her costuming adventures. There were young and not-so-young, women and men but mostly women. Almost all of the people I spoke with are serious sewists – the more complex the outfit the better. The lobby on Friday morning. Once upon a time I was into Victorian ballroom dancing and I had a local seamstress make a Victorian gown for me, but that’s as far as I went. Other than the 1920s-40s, I’m actually not that interested in costuming for myself. So at CC I focused on the fashion history lectures, which were a mixed bag. I noticed quickly that the quality varied. The presenters who were academics gave strong in-depth lectures on their subjects and were able to answer just about any question thrown at them. Lectures given by people who worked in or owned businesses that related to their topic, such as historical shoes, were excellent. But there were some instructors that had simply chosen a topic they liked and done basic internet research and those presentations were thin. Given that everyone who works Costume College, including the instructors, are volunteers perhaps this is not surprising but nevertheless, disappointing. Waiting to walk the Red Carpet. Speaking of volunteers, I tip my hat to the board and every one of the volunteers who spent months putting CC together. I could see how much work it must be and it seemed on the surface to go smoothly. I also want to give a shout out to the Woodland Hills Marriott. I usually don’t care for big corporate hotels, but this one was a pleasure! I had a few minor problems over my stay and the staff were friendly and went out of their way for me. My room was spacious and clean. The two swimming pools were kept immaculate. Back to CC. The organizers ask attendees if they’d like to take a volunteer shift over the weekend and I was happy to do that. At the last minute my original assignment was changed to crowd control at the Red Carpet. People in costume are invited to walk a red carpet on Saturday evening before the Grand Ball. My job was to direct them to a staging room before walking. It was an intense two hours as people in packs kept coming and coming off the elevators donning all array of costumes. Given the theme I spotted many a Queen Victoria. I also saw Renaissance, Regency, Georgian (a very popular choice), Victorian, Edwardian … even a 1920s flapper. There were Steampunk ensembles and a couple of odd sci-fi creature type costumes. After awhile the scene became a whirlwind of time travel, but the nearby Starbucks sign kept me grounded. What did I wear? For the daytime lectures I wore vintage inspired pieces that I made myself, or were custom made, paired with vintage accessories. My look was pretty consistent with what I wear everyday anyway – 1920s/30s. As I mentioned I’m not into extravagant period costumes so I avoided most of the special events. I did briefly pop into one or two and even though it is stressed that no one HAS to wear a costume, I felt pretty uncomfortable. Plus people who attend year after year know each other and kind of stick together. It’s tough for newbies. Turns out I wasn’t the only one not into dressing up. After my volunteer shift I stopped into the Hospitality Suite for a bit of rest and refreshment, I chatted with a couple of women who told me that they enjoy making costumes but not dressing themselves. They explained that there are really two camps at CC – the making and the crafting and the dressing and showing. Overall I enjoyed my first Costume College. I learned new things, met interesting people, and found inspiration here and there. I’d say it’s an experience worth the effort at least once. Interested? The theme next year is: What’s That Fabric. Image courtesy of the ADSC. The Art Deco Society of California’s Gatsby Summer Afternoon is right around the corner Sunday, September 11, 2016. Time to start planning! New to Gatsby Summer Afternoon? Well simply put, it’s THE period event of the year. Attendees arrive at Oakland’s Dunsmuir Hellman Historic Estate decked out in 20s to 40s attire and set up picnic sites using only vintage gear and vintage-style food. The afternoon includes a display of vintage cars, music by Don Neely’s Royal Society Jazz Orchestra, dancing, croquet lessons, touring the Dunsmuir mansion, and contests for: Best Car, Best Costume, Best Charleston, Best Picnic Site. Part of keeping the Art Deco era alive is events like Gatsby Summer Afternoon, which is as close to time-travel as we can get. Heather works at Larkin Street Youth Services where she is special events manager. Those work skills have proved handy – this is her fourth time up as chair of Gatsby Summer Afternoon but she’s quick to point out it’s a team effort with many volunteers helping her to make the magic of the day happen. When was your first Gatsby Summer Afternoon and what stands out about that experience? My first was in 2001, I believe. I went with my high school friend, Julie who came up from Southern California. She made her own dress and I got mine at Dress Barn, but we had the best time putting together our outfits and packing our simple picnic lunch. It was a glorious day and we were in heaven watching all the pretty people go by while lounging on our blanket on the lawn. We then handed out “It’s-It” ice cream sandwiches. That was our volunteer task. We had such a wonderful time and I’ve been “hooked” ever since. How did you go about planning your outfit for the day? I think I just looked at some fashion history books from the library. I was a theater major. In fact, Julie and I had both done some stage work and we both loved old movies, so it came somewhat naturally. I had a small collection of vintage items from my mom and I had loved going to antique and second hand stores to find interesting items for special occasions. A great way to learn about tips and tricks is at the How to Gatsby lecture. Thanks, Heather. The How to Gatsby lecture is coming up on Sunday July 31st, 2pm at Bellevue Club in Oakland. Speaking of tips, as a former picnic site winner what tips would you offer to a new or returning attendee? First, don’t expect to be awarded your first year, it can take some time to collect pretty items. Be sure they are things you like and reflect you and your personality. The one thing we keep in mind with judging is to bestow the award to “classic” picnics that do not fall too strongly into the “theme” category – like western, gypsy, or circus. We tend to favor pure era picnics. Plus keep in mind it’s not just about the plates and linens if you are into winning, it’s also important to prepare appropriate food from the era and possibly dress in the same colors. And having a sense of humor and creativity does not hurt. Think about it, the judges have a very difficult time! As a former and current picnic site judge, I agree that we sure do have a difficult time! But it’s also great fun to walk the grounds and meet so many interesting fellow Art Deco lovin’ people. Heather enjoying Gatsby Summer Afternoon in 2007. Gatsby Summer Afternoon is a full day of activities and time goes by quickly, what would you say is a definite Not To Be Missed? If you have never done it you really should go on the house tour. They are free from 3-4pm in the beautiful mansion. It’s nice to get away from the sun and appreciate the collection of items lovingly displayed. This year we are hiring a “DJ” Tanoa “Samoa Boy” on the porch area of the mansion who will be playing vinyl records with songs from the 20s and 30s! We wanted the folks closer to the mansion, who typically cannot hear the stage entertainment, to have an enjoyable experience. Stop by Stookey’s Club Modern tent to refresh with an authentic cocktail and/or enjoy tastes of delicious wine at the Le Vin Winery tent. Finally, the day would not be complete without the lively Decobelles performance at 3:30. Be sure to line up early since it can be challenging to view. Yep, the Decobelles are always a big hit and I would add don’t miss the crowning of 2016/2017 Miss Art Deco, which happens right after the Decobelles performance. Thank you, Heather for this chat and for all you do putting Gatsby Summer Afternoon together. Click here for tickets and more information about How to Gatsby and Gatsby Summer Afternoon. Image courtesy of the Art Deco Society of California. Those of us who yearn for the grace of the early 20th century have our own time machine called Gatsby Summer Afternoon. 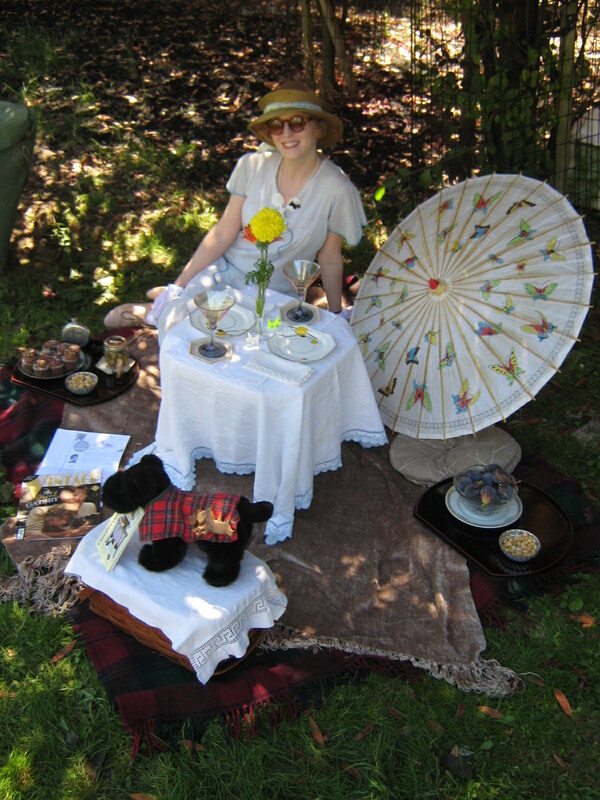 This popular event is a period costume picnic held every second Sunday in September at the Dunsmuir Hellman Historic Estate in the Oakland Hills and it’s produced by the Art Deco Society of California. 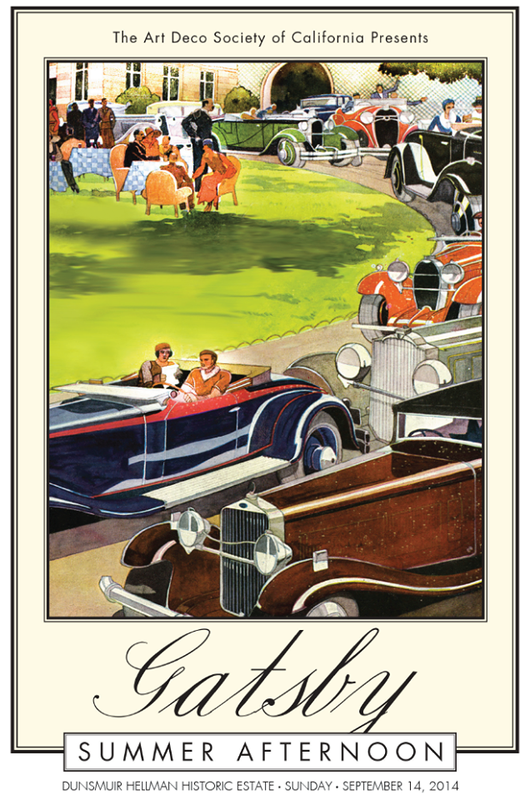 In its 30th year, Gatsby Summer Afternoon is coming up on Sunday, September 14th. Attendees arrive all decked out in 20s garden party day-wear and set up picnic sites using only vintage gear and vintage-style food (hello Jell-O and tea sandwiches). The afternoon includes a display of vintage cars, music by Don Neely’s Royal Society Jazz Orchestra, dancing, croquet lessons, touring the Dunsmuir mansion, and perhaps winning one of the contests for: Best Car, Best Costume, Best Charleston, or Best Picnic Site. Oh, and everyone enjoys the Decobelles dance routine and the crowning of this year’s Miss Art Deco. Last year we set up our Scotty Dog themed picnic site under a tree. There’s plenty of time to purchase tickets and get thinking about what to wear. A little stumped? Not to worry, show up on the day and stop by The Costume Closet where vintage stylist Jonathan Belmares and his assistants will suit you up. Picnic sites can be as simple or elaborate as you like or skip that part and just roam the grounds. and all the dos and don’ts of the day! See you there, Old Sport! Image courtesy of Art Deco Society of California. When you think about it, the characters in F. Scott Fitzgerald’s The Great Gatsby are not exactly likable people, but I suppose that’s not the point. They’ve got style and we like that. Those of us who yearn for the elegance of the early 20th century have our own time machine called Gatsby Summer Afternoon. 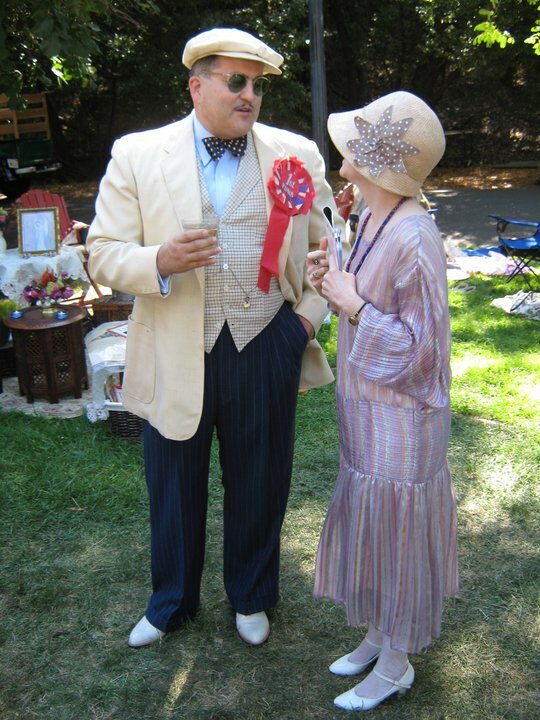 Produced by the Art Deco Society of California, the afternoon is a period costume picnic held at the Dunsmuir Hellman Historic Estate in the Oakland Hills. In its 27th year, Gatsby Summer Afternoon happens on Sunday, September 11. Attendees arrive all decked out in 20s to 40s attire and set up picnic sites using only vintage gear and vintage-style food (hello Jell-O and tea sandwiches). The afternoon includes a display of vintage cars, music by Don Neely’s Royal Society Jazz Orchestra, dancing, croquet lessons, touring the Dunsmuir mansion, and perhaps winning one of the contests for: Best Car, Best Costume, Best Charleston, Best Picnic Site, Best Hat. Girl Reporter interviewing classic car owner Roberto Isola in 2010. Last year I attended as Girl Reporter on assignment for the San Francisco Chronicle. This year I will volunteer to work the event, which I find to be a great way to meet people and stay busy. As for my costume, well that’s the really the fun part. I considered wearing a chiffon floral dress authentic to the period, but it’s fragile. So, to avoid any costume malfunctions I’m opting for a modern made sheath dress in the 20s style. I was concerned about the hem length on the dress, which hits just above the knee, but I discovered in researching that between 1926 and 1928 hems were indeed above the knee. Since bare legs were not the done thing, I’m pondering a rolled stockings look. Last year one of the costume judges mentioned to me that an essential aspect to a winning outfit is cohesion. Thirties shoes paired with a 20s dress is jarring to the trained eye. To help attendees get it right the Art Deco Society of California has helpful tips in their website. I’ve got the dress, a straw cloche hat, and Art Deco jewelry but shoes are the final challenge. Wish me luck and stay tuned.